Windsor redevelopment proposal from 2011 showing the initial plans that include a tower and a new boxy building on the corner. 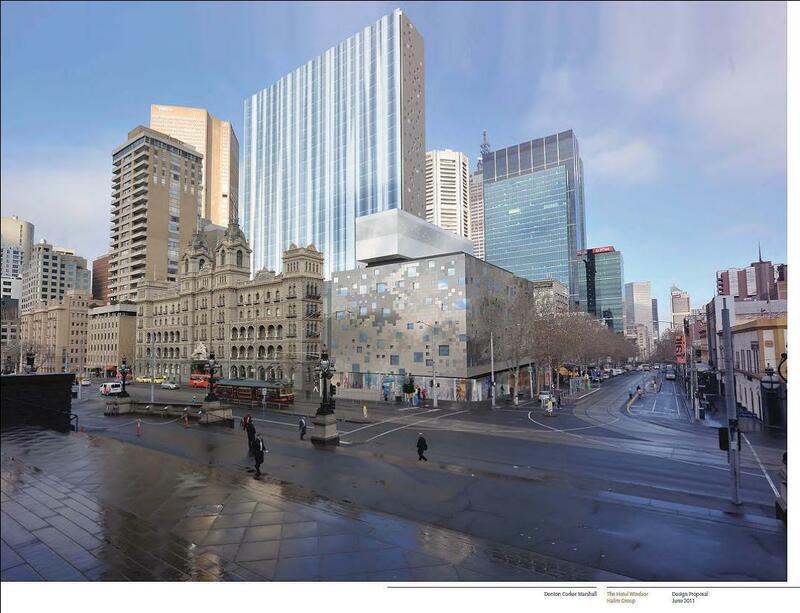 Latest plans lodged with Heritage Victoria show that the owners want to gut the two wings that would be left after demolition of the rest for the tower. Only the dining room, the main stairs and the facades and rear walls of the wings would be left. Not a single heritage room would be left, and even the lounge, like the rooms, would be rebuilt in a ‘non-heritage’ style. The changes to the redevlopment were featured on the CHannel 7 news on Friday and the Planning Minister Mr Guy is apparently also unhappy, link here. ‘Royal Suite’, 506, south end of front wing, only the far wall with fireplace (which would be removed) would remain. ‘Victorian Suite’, south end of front wing, view from lounge to dining. The fireplace would go, and be covered over, and the wall with arched opening, floors and ceiling demolished. Victorian Suite’, south end of front wing, lobby, view to Spring Street. Everything in this image, all walls, doors, skirting, floors, mostly dating from the 1880s or in matching style, would go. There’s a new dimension to this fight – Matthew Guy is currently considering a proposal for a 40 floor tower at 85 Spring Street. This will tower over the Windsor to a much greater extent than the actual Windsor redevelopment itself. We must work to stop this, sign the petition here….